Cider is a natural, liquid beverage that is obtained from the pressing of a finely ground fruit such as apples. Under the proper conditions, it undergoes a natural fermentation process, which yields an alcoholic juice. Cider has been made for thousands of years, however it has only recently seen a significant rise in popularity. Cider is the sweet juice of apples that can be consumed as a beverage or used as a raw material in vinegar making. It is typically a clear, golden drink, which can range in color from a pale yellow to a dark amber rose. It has a fruity flavor and a varying degree of taste from very sweet to tart. Sweet cider is the non-alcoholic versions of cider and it can be made into apple juice by pasteurizing it and adding preservatives to stop the natural fermentation process. 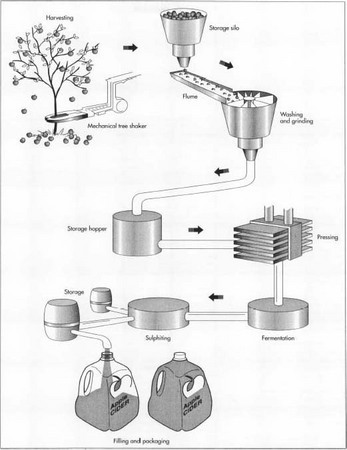 Hard cider is the product that results when the juice is allowed to undergo fermentation. This cider contains alcohol. Additionally, it is often effervescent due to the activity of the natural yeasts present. People have known how to make cider for thousands of years. Archaeological evidence shows that ancient European and Asian cultures used apples to make a crude version of cider as early as 6500 B.C. The art of cider making improved over the years as people developed a better understanding of the factors that impact cider flavor. During the sixth century, a profession of skillful brewers was established in Europe. These people made beer-like beverages and also cider. By the sixteenth century, Normandy became one of the largest cider-making areas in the world. Experimentation with different types of apples ensued, which resulted in better tasting ciders. England and colonial America also produced cider during this time and it became an important part of each culture. The ciders of this time period were inconsistent however, as small farmers each had their own methods of manufacture. The technology of cider production made significant improvements over time as people developed a better understanding of each step in the cider making process. Today, it is a highly controllable operation, which results in a dependable, good-tasting product. Apples are the primary raw material used in cider making. Suitable apples vary in size with diameters from about eight inches wide to less than two inches. Nearly all of the characteristics of the final cider product depend on the quality of the apples from which it is made. To produce the best cider, these apples must be juicy, sweet, well ripened and have adequate levels of natural acids and tannins. The skin of the apples contains many of the compounds that contribute to the taste of the cider so apples are not peeled before being used for cider manufacturing. The seeds are not removed either however, in typical milling machines, they are not broken open, and do not significantly contribute to taste. It should be noted that pears and sweet cherries are also occasionally used to make cider. Once the apples are harvested and washed, the fruit is crushed and pressed. The remaining juice is fermented, creating cider. types of apple juices including aromatic, astringent, acid-tart, and neutral tasting. Generally, sweet and tart apples are blended together to create a balanced cider. A typical blend might include 50% neutral base, 20% tart, 20% aromatic, and 10% astringent. In this cider, the flavor is a balance between tartness and sweetness. Beyond apple blending, some cider producers may also improve flavor by adding tannic, malic, and other natural acids. Tannins add a slight bitter taste and astringency to cider. Malic, citric, and tartaric acid give a zesty tingle. They also help to inhibit microbial contamination. Producing a gallon of cider requires 11-14 lb (5-6.4 kg)of apples depending on the juiciness of the fruit. Fresh cider will remain in its full-bodied state for several weeks if it is refrigerated. After this time natural fermentation process begins. If a non-alcoholic cider is desired, the juice may be pasteurized or preserved by the addition of potassium sorbate. This material effectively kills undesirable organisms. For some cider manufacturers, the alcoholic cider is preferred. Alcoholic cider is made by either letting the inherent fermentation process continue without the addition of any other ingredients, or by adding a variety of ingredients, which give more controllable results. Fermentation of apple cider is the process by which yeast converts the apple sugars into ethyl alcohol and carbon dioxide. It occurs in two steps. First, yeast converts the sugar to alcohol and then lactic acid bacteria convert the natural malic acid into carbon dioxide. This hard cider contains 2-3% solids and 2-8% alcohol. Fermentation aids include components such as sulfur dioxide, yeast, sugar, and natural acids. Sulfur dioxide is typically added to the freshly pressed juice before fermentation is allowed to begin. It has the effect of killing most of the bacteria and yeasts present in the freshly squeezed juice, or must. Enough of the desirable yeast survives the sulfur dioxide treatment and these organisms will go on to ferment the sweet juice. Natural yeasts are present in apples, but sometimes cider manufacturers add their own yeast to ensure that a consistent fermentation will be achieved. Some of these strains have been around for generations and they are repeatedly used to produce a distinctive tasting cider. To help yeasts grow and speed up fermentation, yeast nutrients such as ammonium sulfate and thiamine may also be added. For similar reasons extra sugar, honey or other sweeteners may also be added to the unfermented juice. This will improve fermentation and increase the alcohol content of the final product. The cider making process typically involves three stages including crushing the fruit, pressing out the juice, and allowing it to ferment. To begin however, the fruit must be harvested, sorted, and washed. 1 In the United States, apples are typically harvested in the fall. At this time, field workers pick the apples by hand and transfer them to large storage bins, which can hold about half a ton of fruit. When these bins are filled, they are transported by tractor to the processing plant. At the plant they are stored outside for about a week which allows them to soften. This makes the apples easier to process and increases the amount of sugar in the juice. 2 After the apples have mellowed, they must be washed to remove leaves, twigs, insects, spray residues, and harmful bacteria. To this end, they are automatically poured out from the bins onto a scrubber. This machine rinses and scrubs each apple, removing most chemical residues from the skin. From there, they are moved along a conveyor to a hopper filled with water. A worker is on hand to see that an even stream of apples flows into the bath and makes sure that the apples are thoroughly washed. From the hopper, the apples are put on a conveyor and moved to another worker. Jets of water aid in moving the apples. During manufacture, only whole apples are used because they have not been exposed to the flavor-damaging effects of oxidation. This means that each apple is inspected and any rotten or moldy fruits are removed. Since cider taste can be negatively effected by many different factors, cleanliness is essential during manufacturing. 3 Next, the apples are put in a large mill and ground to a fine pulp with the consistency of applesauce. This is done to ensure that the maximum amount of juice can be extracted from the apples. The finer the pulp, the greater the yield of juice. Fine grinding has the added benefit of reducing damage caused by oxidation. The pulp is put into appropriately labeled 55 gal (208 1) steel drums with plastic liners. Some of these drums continue on through the cider making process while the rest are sent to a freezer to be used later. The frozen pulp ensures that cider can be produced throughout the year when apple supplies are low. 4 To remove the juice from the pulp, or pomace, it is pressed. Depending on the desired cider flavor, the pomace from various types of apple pulp are used. Typically, anywhere from three to six different types are blended together in a large tank. This blend is then taken by the press operator and stacked for pressing. Wooden racks and forms are used for stacking the pomace. Each form is lined with a nylon cloth. Nylon is used because it is easy to clean and sturdy enough to withstand many pressings. To start, several barrels of pomace are poured onto the cloth. The corners are then folded up and the form is removed. As a result, a square-shaped layer of pomace called a cheese is formed. A rack is placed on top of the cheese and another form is put in place. The process is repeated until 10-12 cheeses are in a stack. The whole stack is put in a large stainless steel tray that has been designed to hold the cider as it is pressed from the pomace. A worker puts the stack under the cider press, called a wring, and turns it on. This delivers as much as 30,000 lb (13,620 kg) of pressure from a hydraulic pump. 5 The cider is expelled from the pomace and pumped through plastic tubes to a cooling tank. As the cider is transferred to the cooling tanks, it is passed through a screen mesh to remove any pulp pieces from the liquid. It is then chilled and stored at 33° F (0.6° C). This helps to inhibit the contamination by undesirable microorganisms. If this cider is of the unfermented variety, meant to be unfermented, it is sent to a mixing tank and pasteurized. Preservatives such as potassium sorbate are added and the juice is sent off to the filling lines. 6 Before fermentation is allowed to proceed, the various fermentation-assisting chemicals are added. Depending on the manufacturer, the cider may be allowed to ferment in a large, sealed bulk tank, or in the individual bottles. If it is fermented in the bottles, the product will be sold with a bottom layer of sediment. The sediment is the remains of the fermentation yeast. In bulk fermentation, the cider is siphoned off after the yeast has died. This allows for a sediment-free product. Complete fermentation may take one month or more. 7 When the cider is ready for filling, it is filtered again and pumped into the appropriate packaging. In this filling process, the empty, sterile bottles move along a conveyor and are passed under a filling machine. The machine pumps cider into the bottles to the desired volume. The caps are then put on the bottles and then labeled. The jugs are put in boxes, then pallets, and stored at just above freezing until the next day when they are delivered to stores. There are standard quality control measures, which are performed at various points in the manufacturing process. At the beginning, the apples are checked by line inspectors. This ensures that rotten fruit, twigs, and leaves do not make it into the grinding mill. The pomace may also be inspected before being pressed. This is particularly important when using pomace that has been frozen for many months. For fermented cider, the level of sugar is determined. Since the amount of sugar is directly proportional to the amount of alcohol, this allows the manufacturer to correctly label the product for alcoholic content. Acid testing equipment is also used at this stage to ensure the juice has not been contaminated with acetic acid producing bacteria. After the final packaging, the alcohol level of the cider is determined. The taste, appearance, and other physical and chemical characteristics are verified by trained quality control tasters. Current data suggest that cider production will show significant growth in the near future. This will be a result of the expected continuing movement toward more natural products. Refinements in the manufacturing process should also be expected. This would include more efficient methods for harvesting and sorting apples and improved presses, which will squeeze even more juice out of the pomace. Manufacturers will also develop more useful yeast cultures, which will produce better tasting cider with increased alcohol content. Macrae, R. et al., editors. Encyclopedia of Food Science, Food Technology and Nutrition. San Diego: Academic Press, 1993. Proulx, Annie and Lew Nichols. Sweet & Hard Cider. Charlotte, SC: Garden Way, Inc. 1980. Valentas, Kenneth. Food Processing Operations and Scale-up. New York: Marcel Dekker, 1991. Curtis, Lauren. "Pop Art: Designing Soft Drinks." Food Product Design (January 1998): 41 - 66. I would like to know a bit more about yeast strain and yeast storage conditions. I would also like to get an idea of fermentation equipment and temperatures. I would like to know lots more details of manufactory cider. currentlly think to set up a cider factory? can you help please?